Deer, Moose & Elk: Pour over grain, fruit piles, logs and salt licks. 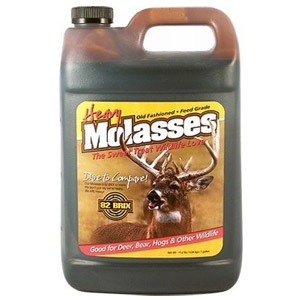 Use in molasses feeders. Hogs & Bear: 1. Mix 1/2 gallon of Heavy Molasses with 5 lbs of plain sugar. 2. Stir until evenly mixed. 3. Cover log tops and stumps with mixture.